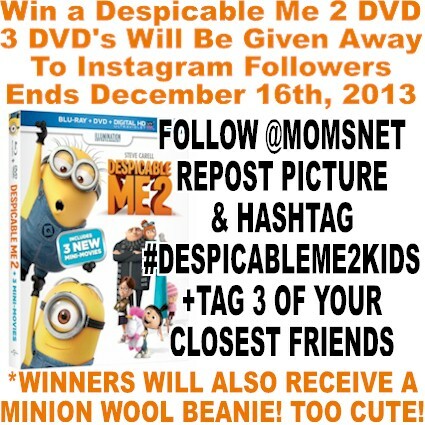 Win Despicable Me 2 AND a Minion Wool Beanie! 5 Winners in All! Celebrate the holidays with the #1 Comedy of the Year, Despicable Me 2! Available on Blu-ray™ Combo Pack and DVD 12/10/13 from Universal Studios Home Entertainment. We are giving away 5 DVD’s AND an adorable Minion wool Beanie! Who wouldn’t want to win??? 2. Follow us on Instagram at http://instagram.com/momsnet, re-post the giveaway picture (download giveaway picture below) with the hashtag #despicableme2kids, +tag 3 of your closest friends. 2. Winners will be randomly chosen on December 16th and will be announced here AND on Instagram. 3. There will be 2 winners who enter via email and 3 winners who enter via Instagram. 3. Winners MUST reply to claim their prize by December 18th or they forfeit their prize. 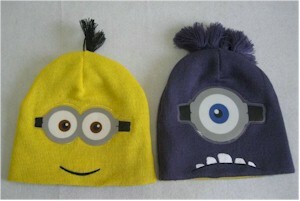 A Minion Wool Beanie is also included with the DVD! Get 10% off best led grow lights when you shop at www.AccessHydro.com. Valid until January 2014.